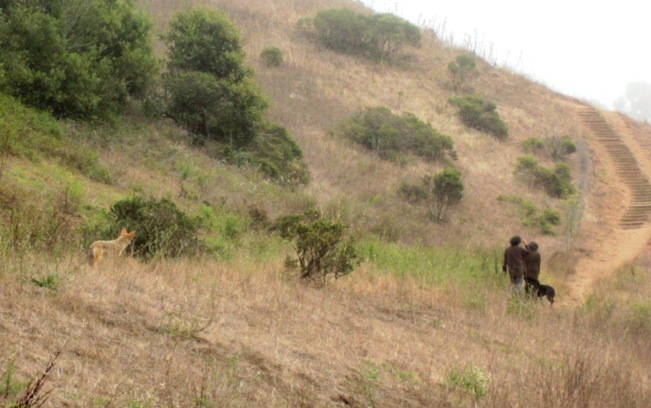 Glen Canyon Park — both the canyon itself and the flat “Safeway Park” above it and adjacent to the Diamond Heights Safeway parking lot — is many things to many folk. Kids play on the grass and the play structure, there’s a ball-field, I’ve seen police cadets training by running around the paved trail of the Safeway Park. It’s a gopher haven — and a de facto dog play area where off-leash dogs run around and socialize and chase each other in circles. 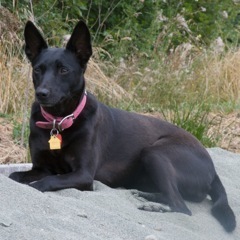 Xena is all-black, smooth coat, about 25 lb., pointy ears. She was last seen at the edge of Safeway Park in Diamond Heights. She’s very, very shy and won’t come near you, so please just call … [ETA: Phone number removed, not needed now]. 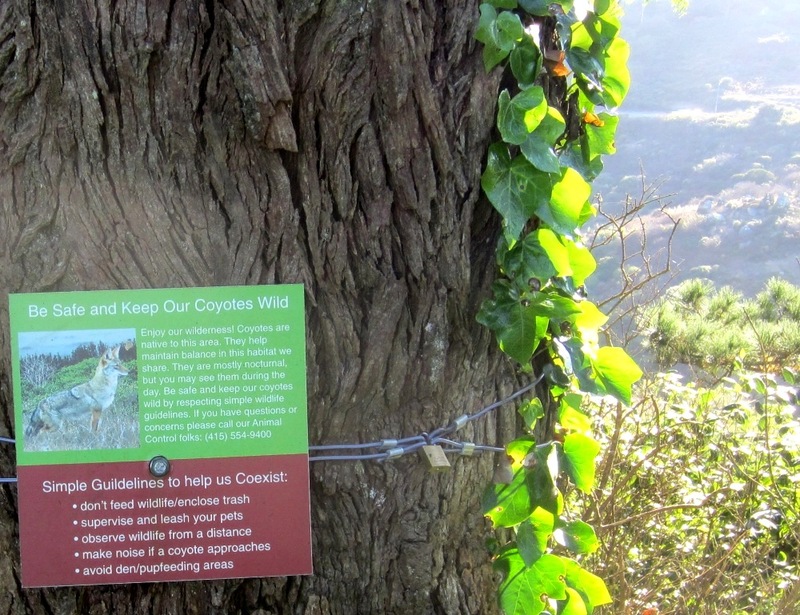 Coyotes don’t have much interest in people, unless someone is feeding them — and that, thankfully, doesn’t appear to be happening in San Francisco. I actually saw a coyote one night in the park. It was hunting gophers. I was taking a walk. I caught it in the beam of my flashlight, and yelled. I needn’t have bothered yelling; the moment I flashed my light on it, it was gone. However, coyotes are very aware of dogs, which are from the same animal family. (They’re canis latrans, dogs are canis lupus familiaris.) Dogs are potential rivals, potential enemies, even potential friends (though it’s probably not a good idea to permit or encourage such friendships). 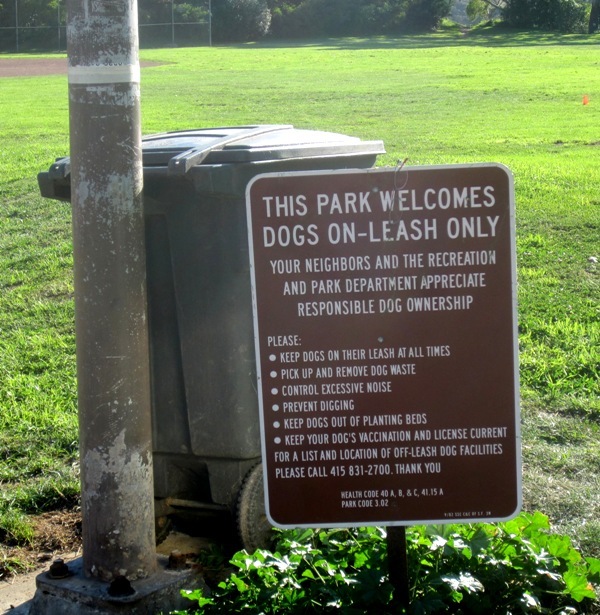 What this means is, Glen Park shouldn’t be treated as an off-leash area, even in the day time. The easiest way to keep a dog safe is to keep it leashed; it won’t be tempted to chase after the coyote pair even if it spots them, and a coyote is not going to chase a dog that’s up close to a person. Rec and Park have put notices everywhere, saying there are coyotes around. They’ve put big notices saying it’s not meant to be an off-leash area for dogs. I can see why people ignore the signs. Dogs need a place to play, and this is convenient and friendly. It’s a delight to watch them romp, and one of the reasons I like to walk there. But it’s not a good idea. If it goes on, it’s only a matter of time before it ends badly for the dogs or the coyotes or both.